Thanks so much for writing. I look forward to connecting with you soon. 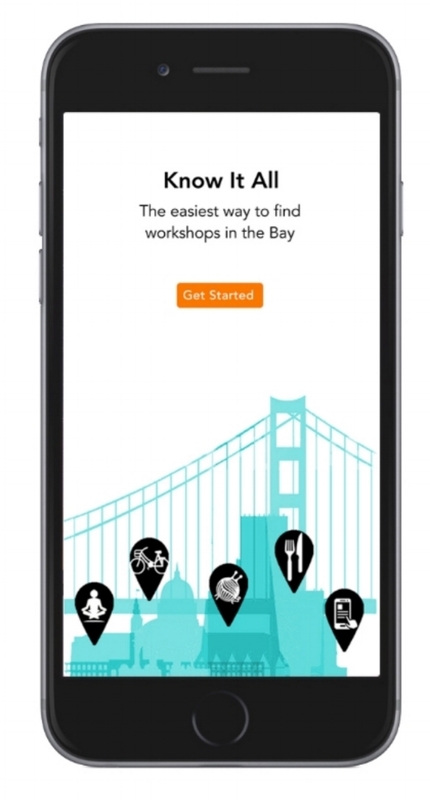 Know It All is a mobile app that I conceived of and designed to take the frustration out of finding workshops and classes in the Bay Area. Users can either browse through all available in-person learning opportunities, or set up their preferences and let them app notify them when something that fits their criteria is added. Users can also choose to follow a certain hashtag to be alerted when a course matching that hashtag is listed in the app. When a class is saved to Favorites, the app converts the Favorites list into a To-Do list that helps the user remember to go to that class. And when a class is checked off, the user's accomplishments are archived for future reference. During these 12 weeks, I completed the entire product lifecycle from initial concept, to the iterative UX workflow, to final UI design and user testing. Because I completed this project as part of a UX certificate program at General Assembly (San Francisco campus), it was eligible for entry in the student category at the 2015 International UX Awards, where it went on to win the Honorable Mention. The 2015 International UX Awards were held at Parsons New School for Design in New York City. There’s a remarkable number of amazing learning opportunities in the Bay Area. Searching for them can be time-consuming and missing out is frustrating. The apps and websites that exist overwhelm users with irrelevant listings, aren’t customizable enough, and lack the alerts that busy users need. My goal was to make finding workshops and classes fast, easy and fun while giving users an experience of relief, gratitude and fun. The top 10 workshop venues (according to Google) in San Francisco are collectively reaching over 54,000 users. If each of those users only spends $100/year on workshops and classes, that’s $5.4 Million in revenue. And there’s a lot more than just 10 venues for workshops and classes in the bay. Bay Area residents also spend twice the national average every year on education: $1,130/yr is the national average, $1,961/yr is the Bay Area average*. At that rate, just a quarter of the people in San Francisco alone are collectively spending $392 Million on education each year. I met face-to-face for in-person interviews with 9 representative users who identified as makers, doers, crafters, lifelong learners, workshop hosts, and workshop facilitators. 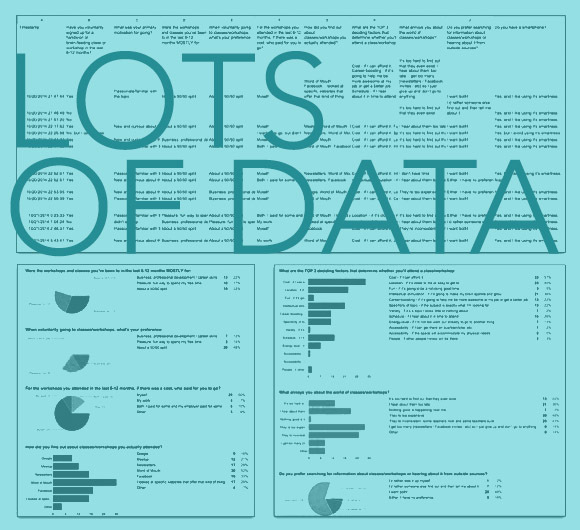 I also facilitated an online survey that had over 50 respondents. Interestingly, but not surprisingly, the factors that resonated as deciding factors for attending a class were often the same or related to users' pain points. Another cool discovery: the group's workshop interest was split nearly 50/50 between business and pleasure. I created 5 different versions of clickable wireframes, all of which were user-tested to discover their strengths and weaknesses. At the earliest stages, I learned that I really needed to simplify the filtering, browse, search and sorting functions. My goal was to distill maximum functionality into the minimum number of screens to keep things moving quickly and not waste a single second of the user’s time. The final round of user testing was a great success due to the many rounds of iteration testing that occurred at the wireframe and rough prototype stage. But as always, I'm intrigued by the surprising things that users say. I like that everything I need to know is right here and that it recommends other things I might be into. This is legit. Can I use this? Like, can I download this right now? Oh gosh, that's so funny, we were JUST talking about this today! We both just moved to the Bay Area and were trying to find classes to take. Is this a dating app? I'm imagining all the cool people I could meet this way. I love that all the information is in one place. Although I decided not to follow through with launching the app as a startup, the feedback I got was incredibly supportive and validated my hypothesis: that users are craving a simpler way to learn about classes and workshops in their local area. To solve that problem, I utilized the best features of hook/trigger design, passive search, and playful reminders to design a product that can solve one of the most frustrating aspects of recreational learning: the hunt for meaningful information.